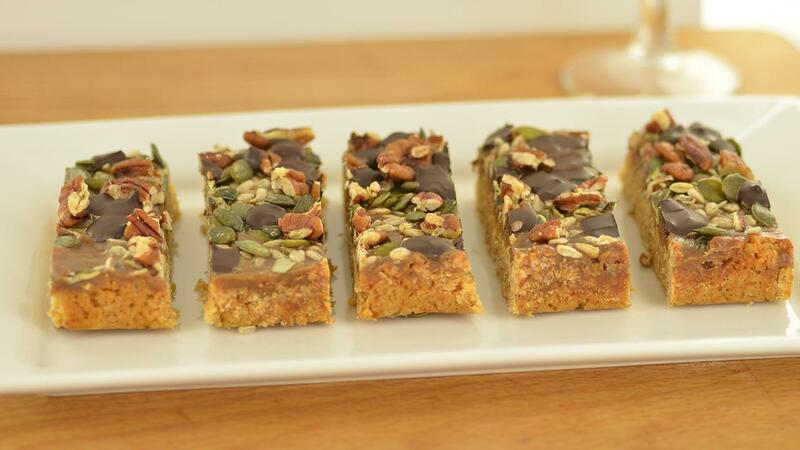 A tasty snack bar made with sticky toffee and seeds, this is perfect for an afternoon tea treat packed with flavour. Preline a ½ Gastronorm tray with greaseproof paper. Place Flora Buttery, honey, golden syrup and brown sugar into a suitable pan and melt until all ingredients are fully incorporated. Fold in the oats and then press the mixture into the pre lined tray. Place the tray into the oven and bake for 20-25 min. Place the Dark Brown Sugar and Meadowland Double into a heavy based pan and bring to a rapid boil. Allow the mixture to reduce by 1/3 then remove from heat and add the butter and stir well, allow to cool slightly. Pour the toffee topping over the flapjack base and the sprinkle over the chocolate chips, pumpkin seeds (90 g)and pecan nuts. Place into the fridge to cool before cutting.